Every retail product sold in the United States & Canada, except books and pharmaceuticals, must have a UPC Code. While GS1 manages all of these code assignments, buying from them is expensive and requires a yearly fee. Elfring Fonts, Inc. offers official UPC codes at a much lower cost and there are no yearly fees, no setup fees, and no registration fees. 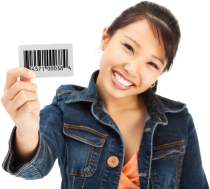 When you buy a UPC barcode from us, you own that number forever! If you buy your UPC code from GS1, you are simply renting that number. You must pay them yearly fees or they revoke your numbers! Every UPC barcode assignment purchased from Elfring Fonts, Inc. comes with a pdf certificate of authenticity. It guarantees your UPC code is unique, that you own that code, and that it has legally been assigned to you! The only companies that can legally sell UPC codes are: GS1 (formerly known as the Uniform Code Council) and those firms that were part of the class action lawsuit against The Uniform Code Council in 2002. No one else is or can be an authorized reseller of UPC codes. What do your get when you purchase? 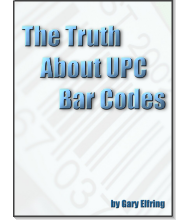 When you purchase a UPC code from us, you will receive your unique UPC code, a certificate of authenticity for that code, an invoice for your purchase, and a free copy of our ebook, "The Truth About UPC Bar Codes"
Complete terms and conditions for the purchase of UPC Codes from Elfring Fonts, Inc. are listed here. You can also look up our UPC code registration in the official GS1 database. UPC codes from Elfring Fonts, Inc. are used on products in stores all over the world including: Amazon, Office Depot, Sears, Target, and Walgreen's. A couple of retail stores may only accept UPC Codes directly assigned to your firm by GS1. These retailers will want to see a copy of your GS1 certificate with your company name and prefix on it. These stores include Kroger & WalMart and may include others. It is your responsibility to check with your retailer before purchasing your UPC Codes from us. Every unique product needs its own separate UPC barcode. For example, if you sell both medium and spicy bottled sauces in 3 different sizes you need 6 unique UPC codes. Elfring Fonts, Inc. has been in the bar code business since 1979! We sell UPC code assignments, bar code printing software, and bar code scanners. Our office is open from 9 - 5 Central Standard Time, Monday - Friday. We are located in St Charles, Illinois- about 50 miles west of Chicago.